Even though Dante Alighieri lived more than a century and a half before the Renaissance master Sandro Botticelli, the two of them seem to be linked by some kind of mysterious connection. The famed painter of such masterpieces as The Birth of Venus and the Allegory of Spring, for example, was so fascinated by the figure of Dante that in 1495 he decided to realize a portrait of him which still remains among the most frequent visual representations of the Sommo Poeta. But what is more, Botticelli was always and rightfully captivated, in particular, by the Divine Comedy, to the extent that he even carried out a long series of drawings illustrating the Inferno, Purgatorio, and Paradiso as described by Dante. A brand new documentary film by Ralph Loop, titled Botticelli. Inferno, sets out to investigate the missing link between these two geniuses by following the painter’s tracks through Florence, the Vatican, and the rest of Europe. Let’s take a closer look at the story behind it! In 2016, concluding its most extensive retrospective ever dedicate to a single artist, the Solomon R. Guggenheim Museum emphatically reaffirmed the critical role of Alberto Burri (1915-1995) in the arts of the second half of the 20th century, as a radical forerunner of New Dada, Nouveau Réalisme, Postminimalism, and Arte Povera. Burri’s internment as prisoner of war in Texas, where he began to paint in 1946, dramatically shaped the new spatial forms of his painting and sculpture. An even greater impact was provided by the great desert landscapes of the American West to which Burri found himself drawn after taking up winter residence in Los Angeles in 1963. Burri Prometheia, a symposium organized by the Department of Italian at UCLA and the Italian Cultural Institute of Los Angeles, aims to examine the heritage of these ties in the largest work Burri ever created outside of Italy, the “Grande Cretto Nero” (Large Black Crack), on the fortieth anniversary of its gifting to UCLA. The work bears striking witness to an intimate and monumental sublimation of the intensity of matter which the artist first noted in the cracking altarpieces of his fellow Italian, Piero della Francesca, and later in the extraordinary superstrata of California’s Death Valley. The Grande Nero Cretto, a work of colossal proportions (49 x 16 feet), composed of 700 pieces of fired ceramic transported from the artist’s home town and assembled at the UCLA Sculpture Garden, represents an uncanny fusion of the visual arts and architecture. Its gifting to UCLA commemorates Burri’s choice to inaugurate his great American traveling exhibition of 1977 precisely at the university. The sculpture offers imposing testimony to the artist’s choice to reside in Los Angeles during the winters of thirty years of his life. First and foremost we want to thank the readers of the blog who keep it alive. Hand in hand with that we wish to thank the many contributors to the MadeinItalymall blog. Apprezziamo molto la risposta positiva del nostro pubblico sulle diverse prospettive che esponiamo sul nostro blog riguardanti l’Italia. Nel ringraziare i nostri lettori, porgiamo a tutti tanti auguri di un nuovo anno pieno di gioia, fortuna e felicità. This past year we continued to receive contributions that come from a variety of sources including regular contributors, comments from readers, as well as one-time articles on topics of particular interest. When we first conceived the ‘virtual piazza’, we envisioned exactly what we have now: a place to find informative, informed, and interesting articles about Italy and Italian culture. While all of the topics on our blog have expanded, those that grew most this past year were the arts, food, and travel. We are always looking for articles from people who are passionate about Italy whether it be about Italian food, travel, fashion, music, film, or any other topic. 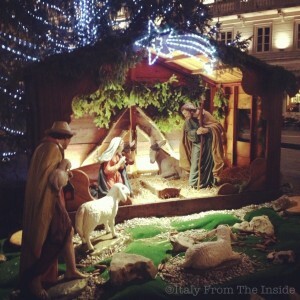 Buon Natale from the Madeinitalymall team! Christmas time. Children love it: as the days go by and the 25th approaches they can hardly wait to see what Santa is going to leave underneath the tree. Most adults, whether they like to admit it or not, are also fascinated by Christmas time: lights are shining bright, decorations make every town look prettier, and one can indulge in hot mulled wine or one too many cookies without feeling overly guilty. All over Italy, in big cities and small villages alike, the month of December is packed with Christmas events that range from religious processions and live nativity scenes to concerts and meetings with Santa Claus: there is something for everyone, so all one has to do is take their pick. Or not. Actually there is one place where everyone and everything sort of comes together, and that place is the traditional mercatino di Natale, the Christmas market. Photo: Polenta from wikimedia commons contributed by Dorothy. Article by VegItalyGuide. Pasta, bread and traditional risottos are not the only staples you will find in Italy! 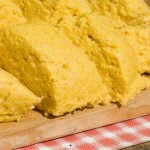 Especially northern Italy, where polenta, a corn based dish, is a common food in many of the households. 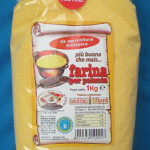 Polenta is corn meal added with water, salt and some olive oil. Regions where you will commonly find polenta are Lombardy, Piemonte, Veneto and Valle d’ Aosta, where the temperatures are usually a bit cold in winter, hence the heavier food. It is extremely versatile and can be used for the base in several different dishes. Many traditional recipes use polenta along with mushrooms or a meat-based meal, however polenta, as versatile as it is, can also be eaten as a side with rosemary carrots and brown lentils, or home-cooked black beans and tomatoes with basil (as done in many south American places). It is economical and very easy to make, however cooking time is around 40-45 minutes so be prepared to do some stirring if you are cooking polenta. Some grocery stores will sell it already made in a tube, so you can just open, heat and serve. Just read the ingredient labels first, since you never know what kind of additives they put in there. You can also use pre-cooked or fast cooking corn meal, which usually cooks in about 10 minutes. Make sure they have not used animal broth in place of water. Some restaurants will use broth they have left from meat meals to use for polenta or risottos. They may also use the “dado” cubes, which are the bullion cubes used to make broths. The only way to know is to ask how they make the polenta. They may also use store-bought tubes; just depends how authentic the restaurants are. 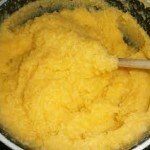 Some places will also add milk or butter to the polenta for a creamy effect. Again, you will need to ask. Some places add cheese to the top, usually grated parmesan, for added taste. If the recipe on the menu says formaggio make sure to ask for it senza or without. and olive oil can be added when it is finished to give it a creamy texture. The polenta is cooked when it starts to “peel” away from the side of the pot. After it is cooked, it is laid onto a wooden cutting board and can rest for about 5 minutes to harden a bit. Then can be cut into portion size pieces. You can also serve it directly from the pot, where it will be a softer consistency. The taste is still the same, though! Italian cuisine is… first and foremost, quality. The best. Beauty. Richness and good-ness. Breeders, farmers, prod-ucers. Social responsibility. Our culture. History. Tradition. Art. Being together. Hospitality and well-being. Emotion. Love, sensitivity and memory. Biodiversity. The symbol of Italy. Everything that makes you feel good. Sun, sea and Viva Italia. Like an impressionist painting, there are many ways to tell of the multiplicity of Italy and of being Italian through its cuisine. Only when they are put all together does it make up the whole picture. It is like a series of images that an attentive director who, careful with details, does not omit anything in order to show every aspect of his characters, all the angles of a face, all the nuances of a scene. What are some traditional Italian herbs you can use in your dishes? In Italy, there are certain herbs that are traditionally “Italian” meaning that they are used most frequently. Regions do change and in northern Italy you will find more delicate flavors, less spicy and sometimes even bland, depending on your taste buds. Farther south you will find spicier foods, although many of the herbs used in Italy remain the same throughout. 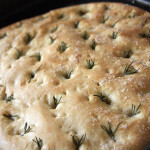 rosemary rosmarino A classic Italian herb, rosmarino is found in focaccia bread, crackers or grissini, soups and of course, patate al forno (oven-roasted potatoes). oregano origano Origano can be often found on the top of bruschetta, in many soups or even salads and commonly on oven-cooked or marinated foods, such as marinated eggplant. basil basilico Basilico is found everywhere in Italy. Thought to ward of depression and help to improve mood in general, basilico is used fresh in many sauces, such as tomato sauce for pasta. It is best when cooked all the way down, since it really adds a nice flavor or you can try it fresh in a salad. It is also the base for pesto sauce, which can be made very easily just by mashing fresh basil with some salt, olive oil and pine nuts! thyme timo Timo is used frequently in soups. It adds a wonderful aroma and can easily be bought at any grocery store in the dried variety. Or you can plant a small herb garden of your own! It is relatively easy to grow in the house, as the plant will not grow out of control. 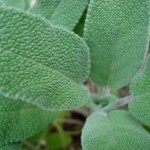 sage salvia Salvia is an excellent addition to a very simple pasta dish commonly found in northern regions of Italy. You just add a bit of salt, olive oil and fresh sage to any pasta for a very delicious, refreshing and light pasta dish! 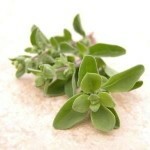 Sage also helps to freshen the breath, so as long as there was no heavy garlic used anywhere, you should be OK! parsley prezzemolo Prezzemolo grows everywhere and is one of the easiest herbs to grow. It can be quite large and grows quickly. Parsley can be used in sauces and can be substituted for basil in pesto sauces. marjoram maggiorana This can be a great addition to vegetables like sauteed carrots or zucchini. It also adds excellent flavor to soups and oven-baked dishes. It can be challenging to grow sometimes, but the wait will be worth it! It is also used by some homeopaths to cure headaches.